In 1987 graduated the Faculty of Dentistry from Bucharest with a “Doctor of Medical Dentistry” diploma. In 2003 he received a “Doctor of Medical Science” diploma from the Faculty of Medicine. He is currently professor at the Faculty of Dentistry – Fixed Prosthodontics and Ocluzology department. Member of professional associations: UNAS (National Union of Dental Associations), ISCD (International Society of Computerized Dentistry) and World Dental Federation. 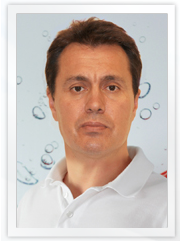 Dr. Alexandru Petre is a specialist in working with prothetics made by digital scanning. He deals within the clinic with pacients with problems like occlusion and patients seeking dental implants.